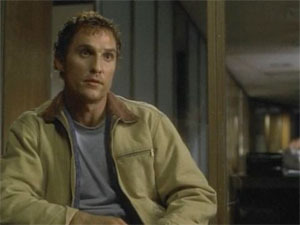 Fenton Meiks (Matthew McConaughey) enters the offices of FBI Agent Wesley Doyle (Powers Boothe). Fenton wants to tell Agent Doyle the information he has on the serial killer the FBI are looking for called the God’s Hand Killer. Fenton tells Doyle that his recently deceased brother Adam is the killer they’re looking for. Agent Doyle asks Fenton how he knows this for certain. 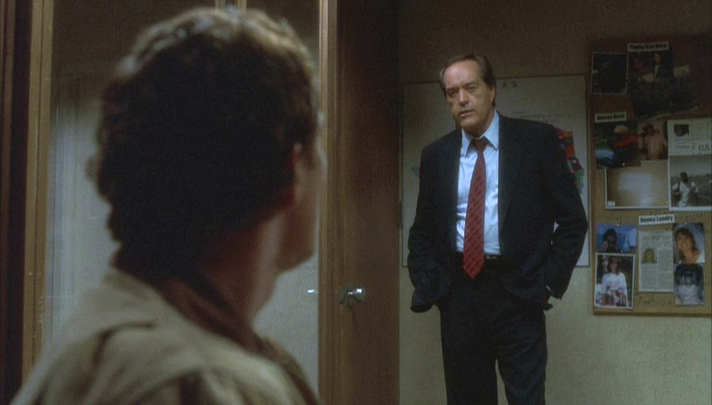 Fenton begins by telling Doyle about his father who claimed he had god given powers to see the demons inside ordinary people, and that it was his job to kill them. 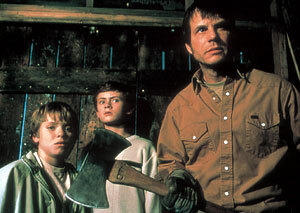 Dad Meiks (Bill Paxton) wakes his young children Fenton and Adam to tell them that an angel visited him in the night. He claimed the angel would give him the power to see the demons inside people and the sins they have committed. The angel also said that Dad would be given tools to help him incapacitate, transport and kill the demons with. Dad would get a name of a demon and find them. He would then touch them and see what they’ve done. The tool he would use to stun them was a metal pole. He would then have to put on gloves to carry them so that he wouldn’t keep seeing their sins. Finally he’d use an axe to kill and dismember the bodies. In order to do this in secret, Dad Meiks has his boys dig a hole in the yard which they can kill in private. Young Adam believes his dad has the powers that he claims to have, however young Fenton is not so sure. Fenton thinks his dad is crazy and his making this up. This worry is exacerbated when Dad Meiks claims that the name the angel has given to him is Fenton’s, but that he can’t believe it and thinks he can change the doubts Fenton is having. As thing progress Fenton begins to fear for his life and the safety of any further targets his father claims are demons. Back in the present time Doyle finds the whole story fanciful. However there is one last twist in the tale. You’ll have to watch it to find out. This fantastic thriller was directed by Bill Paxton. To my knowledge he has only directed this and one other feature. Based on this film, it’s a shame he doesn’t direct more movies as it really is fantastic. 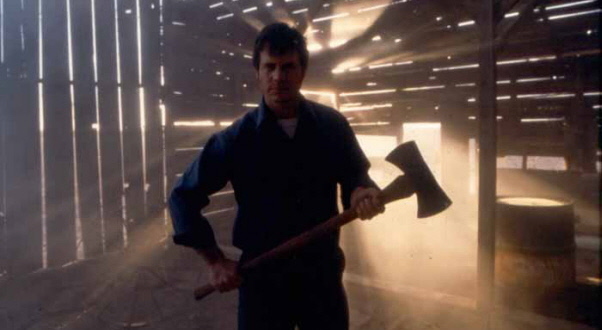 Bill Paxton is on top form as Dad Meiks. Powers Boothe is great as Agent Doyle who really doesn’t buy the story he’s being told, and Matthew McConaughey is great as Fenton Meiks. 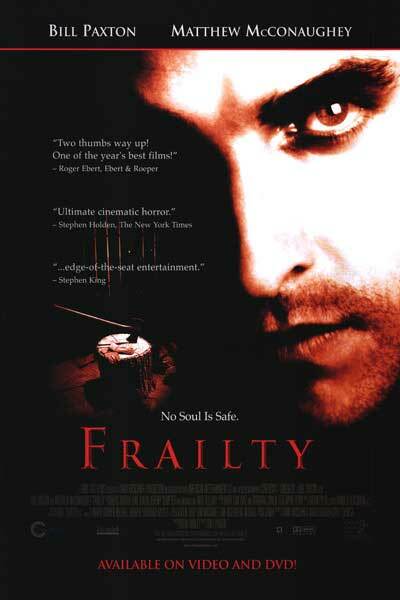 I know many people haven’t seen this as it was in and out of the cinema faster than a rat up a drainpipe. It is well worth tracking down and watching, the twist is amazing and you won’t see it coming. The definition of cult cinema.